I have a bit of a "thing" for European DS game cases. Oh, get your minds out of the gutter. I don't mean that I, uh, do things with them; I mean that I have an odd attraction to them. It all started when I bought a copy of Freshly-Pickled Tingle's Rosy Rupeeland from the UK. 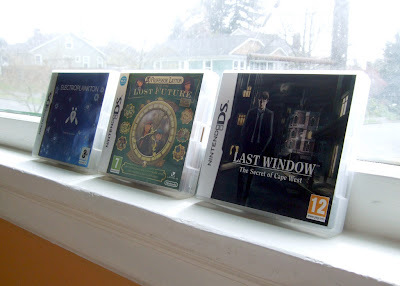 For some unknown reason, that game's clear, thicker-than-the-ones-we-get-in-North-America case (see it in this photo) appealed to me so much that I wanted a few more. Sadly--for my bank account, especially--I'm not through purchasing such games. I plan on picking up a copy of the Euro release of Inazuma Eleven at some point this year, for instance, and I also hope to buy a copy of Professor Layton and the Spectre's Call (the fourth in the series--it was called Professor Layton and the Last Specter in the States). After that, though, I probably put a cork in this particular obsession--or at least that's what I'm hoping to do. Is it just the different plastic that gets you, Bryan? I imagine it's to accomodate the potentially thicker multilanguage manuals, but I don't know if it's ever been confirmed. Oh, that makes sense! They certainly do seem thicker than your average North American manuals, that's for sure.